The ribosome (/ˈraɪbəˌsoʊm, -boʊ-/) is a complex molecular machine, found within all living cells, that serves as the site of biological protein synthesis (translation). Ribosomes link amino acids together in the order specified by messenger RNA (mRNA) molecules. Ribosomes consist of two major components: the small ribosomal subunits, which read the RNA, and the large subunits, which join amino acids to form a polypeptide chain. Each subunit consists of one or more ribosomal RNA (rRNA) molecules and a variety of ribosomal proteins (r-protein or rProtein). The ribosomes and associated molecules are also known as the translational apparatus. Figure 1: Ribosomes assemble polymeric protein molecules whose sequence is controlled by the sequence of messenger RNA molecules. This is required by all living cells and associated viruses. Figure 2: Large (red) and small (blue) subunit fit together. Figure 3: Atomic structure of the 30S subunit from Thermus thermophilus. Proteins are shown in blue and the single RNA chain in brown. The ribosomal subunits of bacteria and eukaryotes are quite similar. The unit of measurement used to describe the ribosomal subunits and the rRNA fragments is the Svedberg unit, a measure of the rate of sedimentation in centrifugation rather than size. This accounts for why fragment names do not add up: for example, bacterial 70S ribosomes are made of 50S and 30S subunits. Bacteria have 70S ribosomes, each consisting of a small (30S) and a large (50S) subunit. E. coli, for example, has a 16S RNA subunit (consisting of 1540 nucleotides) that is bound to 21 proteins. The large subunit is composed of a 5S RNA subunit (120 nucleotides), a 23S RNA subunit (2900 nucleotides) and 31 proteins. Eukaryotes have 80S ribosomes located in their cytosol, each consisting of a small (40S) and large (60S) subunit. Their 40S subunit has an 18S RNA (1900 nucleotides) and 33 proteins. The large subunit is composed of a 5S RNA (120 nucleotides), 28S RNA (4700 nucleotides), a 5.8S RNA (160 nucleotides) subunits and 46 proteins. 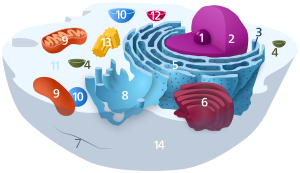 In eukaryotes, ribosomes are present in mitochondria (sometimes called mitoribosomes) and in plastids such as chloroplasts (also called plastoribosomes). They also consist of large and small subunits bound together with proteins into one 70S particle. These ribosomes are similar to those of bacteria and these organelles are thought to have originated as symbiotic bacteria Of the two, chloroplastic ribosomes are closer to bacterial ones than mitochrondrial ones are. Many pieces of ribosomal RNA in the mitochrondria are shortened, and in the case of 5S rRNA, replaced by other structures in animals and fungi. In particular, Leishmania tarentolae has a minimalized set of mitochondrial rRNA. The cryptomonad and chlorarachniophyte algae may contain a nucleomorph that resembles a vestigial eukaryotic nucleus. Eukaryotic 80S ribosomes may be present in the compartment containing the nucleomorph. The differences between the bacterial and eukaryotic ribosomes are exploited by pharmaceutical chemists to create antibiotics that can destroy a bacterial infection without harming the cells of the infected person. Due to the differences in their structures, the bacterial 70S ribosomes are vulnerable to these antibiotics while the eukaryotic 80S ribosomes are not. Even though mitochondria possess ribosomes similar to the bacterial ones, mitochondria are not affected by these antibiotics because they are surrounded by a double membrane that does not easily admit these antibiotics into the organelle. The same cannot be said of chloroplasts, where antibiotic resistance in ribosomal proteins is a trait to be introduced as a marker in genetic engineering. Figure 4: Atomic structure of the 50S subunit from Haloarcula marismortui. Proteins are shown in blue and the two RNA chains in brown and yellow. The small patch of green in the center of the subunit is the active site. Ribosomes act as catalysts in two extremely important biological processes called peptidyl transfer and peptidyl hydrolysis. The "PT center is responsible for producing protein bonds during protein elongation". Figure 5: Translation of mRNA (1) by a ribosome (2)(shown as small and large subunits) into a polypeptide chain (3). The ribosome begins at the start codon of RNA (AUG) and ends at the stop codon (UAG). The ribosome is known to actively participate in the protein folding. The structures obtained in this way are usually identical to the ones obtained during protein chemical refolding, however, the pathways leading to the final product may be different. In some cases, the ribosome is crucial in obtaining the functional protein form. For example, one of the possible mechanisms of folding of the deeply knotted proteins relies on the ribosome pushing the chain through the attached loop. Figure 6: A ribosome translating a protein that is secreted into the endoplasmic reticulum. Many textbooks suggest that there are only two kinds of ribosomes, namely prokaryotic and eukaryotic ribosomes. However, ribosomes are surprisingly heterogeneous with different compositions in different species. Heterogeneous ribosomes have different structures and thus different activities compared to typical ribosomes in major model organisms. Figure 7: The location of specialized ribosomal proteins (RPs) on the yeast ribosome on the small ribosomal unit (SSU)and large ribosomal subunit (LSU). Highlighted in green are the RPs on the SSU that increase translation of wild type Renilla luciferase (REN) gene and FF (Firefly) luciferase. Highlighted in green are the RPs on LSU that increase the expression of LAMB3 reporter with premature termination codons (PTC). A group of highly acidic ribosomal proteins (RPs), also known as P proteins, are known to be present on the 60S subunit in multiple copies in the ribosomes stalk and P proteins mediate selective translation. These P proteins can be found in yeast and mammalian cells. If P proteins are not present in yeast this can cause the yeast to have a cold-sensitive phenotype. If P proteins are not present in human cells, this could cause autophagy induction. Certain ribosomal proteins are absolutely critical while others are not. For instance, Rpl28 and Rpl5 mutant flies are alive but have abnormally large wings. Rpl38 also appears to be critical in mammals only under very specific conditions: in mice Rpl38 is required for the translation of a subset of Hox mRNA and a mutation of Rpl38 lead to a homeotic transformation with a short tail. Other ways heterogeneity can arise from post-translational modifications to RPs include acetylation and methylation in species like yeast, Arabidopsis, and human cells. But there is no overall change in protein synthesis. Modifications to core ribosomal proteins (RPs) can also give rise to the formation of heterogeneous ribosomes. For instance, in yeast, Rpl28 ubiquitination levels vary with the cell cycle. Ribosomes with the polyubiquitinated Rpl28 carry out protein synthesis at a higher rate in vitro compared with ribosomes with monoubiquitinated Rpl28. Figure 8: Types of ribosome heterogeneity and its components. Heterogeneous ribosomes can also arise from other factors binding to the ribosome surface. For example, ribosome-associated factor (RACK1) is so tightly associated with the ribosome that its binding is resistant to high-salt washes in vitro. RACK1 is required for efficient translation of mRNA with short open reading frames. Viral IRES (internal ribosome entry site) translations can also be mediated by specialized ribosomes. Specifically, 40S ribosomal units without RPS25 in yeast and mammalian cells are unable to begin translation from two viral IRESes, namely the hepatitis C virus IRES and the cricket paralysis virus (CrPV) intergenic region. The CrPV only needs RPS25 to begin translation and mediate ribosome recruitment. Usually if RPS25 is not present in a certain IRES, imitation from these IRESes can be defective. Heterogeneity of ribosomal RNA modifications plays an important role in structural maintenance and/or function, such as modulating translation and most mRNA modifications are found in highly conserved regions. The most common rRNA modifications are pseudouridylation and 2’-O methylation of ribose. ^ Salini Konikkat: Dynamic Remodeling Events Drive the Removal of the ITS2 Spacer Sequence During Assembly of 60S Ribosomal Subunits in S. cerevisiae. Archived 2017-08-03 at the Wayback Machine Carnegie Mellon University Dissertations, February 2016. ^ Benne R, Sloof P (1987). "Evolution of the mitochondrial protein synthetic machinery". BioSystems. 21 (1): 51–68. doi:10.1016/0303-2647(87)90006-2. PMID 2446672. ^ "Ribosomes". Archived from the original on 2009-03-20. Retrieved 2011-04-28. ^ Palade, G.E. (January 1955). "A small particulate component of the cytoplasm". J Biophys Biochem Cytol. 1 (1): 59–68. doi:10.1083/jcb.1.1.59. PMC 2223592. PMID 14381428. ^ "The Nobel Prize in Physiology or Medicine 1974". Nobelprize.org. The Nobel Foundation. Archived from the original on 26 January 2013. Retrieved 10 December 2012. ^ "2009 Nobel Prize in Chemistry". The Nobel Foundation. Archived from the original on 8 April 2012. Retrieved 10 December 2012. ^ Kurland, C.G. (1960). "Molecular characterization of ribonucleic acid from Escherichia coli ribosomes". Journal of Molecular Biology. 2 (2): 83–91. doi:10.1016/s0022-2836(60)80029-0. ^ Wilson, Daniel N.; Doudna Cate, Jamie H. (May 2012). "The Structure and Function of the Eukaryotic Ribosome". Cold Spring Harbor Perspectives in Biology. 4 (5): a011536. doi:10.1101/cshperspect.a011536. ISSN 1943-0264. PMC 3331703. PMID 22550233. ^ Nissen, P.; Hansen, J.; Ban, N.; Moore, P.B. ; Steitz, T.A. (2000-08-11). "The structural basis of ribosome activity in peptide bond synthesis". Science. 289 (5481): 920–30. Bibcode:2000Sci...289..920N. doi:10.1126/science.289.5481.920. PMID 10937990. ^ a b Wimberly BT, Brodersen DE, Clemons WM Jr, Morgan-Warren RJ, Carter AP, Vonrhein C, Hartsch T, Ramakrishnan V (September 2000). "Structure of the 30S ribosomal subunit". Nature. 407 (6802): 327–39. Bibcode:2000Natur.407..327W. doi:10.1038/35030006. PMID 11014182. ^ a b c d e f g Alberts, Bruce; et al. (2002). The Molecular Biology of the Cell (4th ed.). Garland Science. p. 342. ISBN 978-0-8153-3218-3. ^ Reginald Garrett and Charles M. Grisham: Biochemistry. (International Student Edition). Cengage Learning Services; 4th edition 2009; ISBN 978-0-495-11464-2; p. 962. ^ Czernilofsky, A; Küchler, E; Stöffler, G.; Czernilofsky, P. (1976). "SITE OF REACTION ON RIBOSOMAL-PROTEIN L27 WITH AN AFFINITY LABEL DERIVATIVE OF TRANSFER-RNA-F(MET)". FEBS Letters. 63 (2): 283–286. doi:10.1016/0014-5793(76)80112-3. PMID 770196. ^ Czernilofsky, A; Collatz, E; Stöffler, G; Küchler, E (1974). "PROTEINS AT TRANSFER-RNA BINDING-SITES OF ESCHERICHIA-COLI RIBOSOMES". Proceedings of the National Academy of Sciences of the United States of America. 71 (1): 230–234. doi:10.1073/pnas.71.1.230. PMC 387971. PMID 4589893. ^ Czernilofsky, A; Kurland, C.G. ; Stöffler, G. (1975). "30S ribosomal proteins associated with 3′-terminus of 16S RNA". FEBS Letters. 58 (1): 281–284. doi:10.1016/0014-5793(75)80279-1. PMID 1225593. ^ a b c Ben-Shem A, Garreau de Loubresse N, Melnikov S, Jenner L, Yusupova G, Yusupov M (February 2011). "The structure of the eukaryotic ribosome at 3.0 Å resolution". Science. 334 (6062): 1524–1529. Bibcode:2011Sci...334.1524B. doi:10.1126/science.1212642. PMID 22096102. ^ Reginald Garrett and Charles M. Grisham: Biochemistry. (International Student Edition). Cengage Learning Services; 4th edition 2009; ISBN 978-0-495-11464-2; p. 965. ^ Czernilofsky, A; Collatz, Ekkehard; Gressner, Axel M.; Wool, Ira G.; Küchler, Ernst (1977). "IDENTIFICATION OF TRNA-BINDING SITES ON RAT-LIVER RIBOSOMES BY AFFINITY LABELING". Molecular and General Genetics. 153 (3): 231–235. doi:10.1007/BF00431588. ^ Agrawal, RK; Sharma, MR (December 2012). "Structural aspects of mitochondrial translational apparatus". Current Opinion in Structural Biology. 22 (6): 797–803. doi:10.1016/j.sbi.2012.08.003. PMC 3513651. PMID 22959417. ^ Sharma, MR; Booth, TM; Simpson, L; Maslov, DA; Agrawal, RK (16 June 2009). "Structure of a mitochondrial ribosome with minimal RNA". Proceedings of the National Academy of Sciences of the United States of America. 106 (24): 9637–42. Bibcode:2009PNAS..106.9637S. doi:10.1073/pnas.0901631106. PMC 2700991. PMID 19497863. ^ Archibald, J.M. ; Lane, C.E. (2009). "Going, going, not quite gone: nucleomorphs as a case study in nuclear genome eduction". Journal of Heredity. 100 (5): 582–590. doi:10.1093/jhered/esp055. PMID 19617523. ^ Recht MI, Douthwaite S, Puglisi JD (1999). "Basis for bacterial specificity of action of aminoglycoside antibiotics". EMBO J. 18 (11): 3133–8. doi:10.1093/emboj/18.11.3133. PMC 1171394. PMID 10357824. ^ O'Brien, T.W. (1971). "The General Occurrence of 55S Ribosomes in Mammalian Liver Mitochondria". J. Biol. Chem. 245: 3409. ^ Newman, SM; Boynton, JE; Gillham, NW; Randolph-Anderson, BL; Johnson, AM; Harris, EH (December 1990). "Transformation of chloroplast ribosomal RNA genes in Chlamydomonas: molecular and genetic characterization of integration events". Genetics. 126 (4): 875–88. PMC 1204285. PMID 1981764. ^ a b Ban N, Nissen P, Hansen J, Moore P, Steitz T (2000). "The complete atomic structure of the large ribosomal subunit at 2.4 Å resolution". Science. 289 (5481): 905–20. CiteSeerX 10.1.1.58.2271. doi:10.1126/science.289.5481.905. PMID 10937989. ^ Schluenzen F, Tocilj A, Zarivach R, Harms J, Gluehmann M, Janell D, Bashan A, Bartels H, Agmon I, Franceschi F, Yonath A (September 1, 2000). "Structure of functionally activated small ribosomal subunit at 3.3 Å resolution". Cell. 102 (5): 615–23. doi:10.1016/S0092-8674(00)00084-2. PMID 11007480. ^ Yusupov MM, Yusupova GZ, Baucom A, et al. (May 2001). "Crystal structure of the ribosome at 5.5 Å resolution". Science. 292 (5518): 883–96. doi:10.1126/science.1060089. PMID 11283358. ^ Schuwirth BS, Borovinskaya MA, Hau CW, et al. (November 2005). "Structures of the bacterial ribosome at 3.5 Å resolution". Science. 310 (5749): 827–34. doi:10.1126/science.1117230. PMID 16272117. ^ Mitra K, Schaffitzel C, Shaikh T, et al. (November 2005). "Structure of the E. coli protein-conducting channel bound to a translating ribosome". Nature. 438 (7066): 318–24. Bibcode:2005Natur.438..318M. doi:10.1038/nature04133. PMC 1351281. PMID 16292303. ^ Selmer M, Dunham CM, Murphy FV, et al. (September 2006). "Structure of the 70S ribosome complexed with mRNA and tRNA". Science. 313 (5795): 1935–42. Bibcode:2006Sci...313.1935S. doi:10.1126/science.1131127. PMID 16959973. ^ Korostelev A, Trakhanov S, Laurberg M, Noller HF (September 2006). "Crystal structure of a 70S ribosome-tRNA complex reveals functional interactions and rearrangements". Cell. 126 (6): 1065–77. doi:10.1016/j.cell.2006.08.032. PMID 16962654. ^ Yusupova G, Jenner L, Rees B, Moras D, Yusupov M (November 2006). "Structural basis for messenger RNA movement on the ribosome". Nature. 444 (7117): 391–4. Bibcode:2006Natur.444..391Y. doi:10.1038/nature05281. PMID 17051149. ^ a b "Specialized Internal Structures of Prokaryotes | Boundless Microbiology". courses.lumenlearning.com. Retrieved 2018-09-27. ^ Savir, Y; Tlusty, T (Apr 11, 2013). "The ribosome as an optimal decoder: a lesson in molecular recognition". Cell. 153 (2): 471–9. doi:10.1016/j.cell.2013.03.032. PMID 23582332. ^ Rodnina, M.V. ; Beringer, M.; Wintermeyer, W. (January 2007). "How ribosomes make peptide bonds". Trends Biochem. Sci. 32 (1): 20–6. doi:10.1016/j.tibs.2006.11.007. PMID 17157507. ^ Cech, T. (August 11, 2000). "Structural biology. The Ribosome Is a Ribozyme". Science. 289 (5481): 878–9. doi:10.1126/science.289.5481.878. PMID 10960319. ^ Fedorov, Alexey N.; Baldwin, Thomas O. (1997-12-26). "Cotranslational Protein Folding". Journal of Biological Chemistry. 272 (52): 32715–32718. doi:10.1074/jbc.272.52.32715. ISSN 0021-9258. PMID 9407040. ^ Baldwin, Robert L. (June 1975). "Intermediates in Protein Folding Reactions and the Mechanism of Protein Folding". Annual Review of Biochemistry. 44 (1): 453–475. doi:10.1146/annurev.bi.44.070175.002321. ISSN 0066-4154. PMID 1094916. ^ Dabrowski-Tumanski, Pawel; Piejko, Maciej; Niewieczerzal, Szymon; Stasiak, Andrzej; Sulkowska, Joanna I. (2018-10-12). "Protein Knotting by Active Threading of Nascent Polypeptide Chain Exiting from the Ribosome Exit Channel". The Journal of Physical Chemistry B. 122 (49): 11616–11625. doi:10.1021/acs.jpcb.8b07634. ISSN 1520-6106. PMID 30198720. ^ Brandman O, et al. (2012). "A ribosome-bound quality control complex triggers degradation of nascent peptides and signals translation stress". Cell. 151 (5): 1042–54. doi:10.1016/j.cell.2012.10.044. PMC 3534965. PMID 23178123. ^ Defenouillère Q, et al. (2013). "Cdc48-associated complex bound to 60S particles is required for the clearance of aberrant translation products". Proc Natl Acad Sci U S A. 110 (13): 5046–51. Bibcode:2013PNAS..110.5046D. doi:10.1073/pnas.1221724110. PMC 3612664. PMID 23479637. ^ Shen PS, et al. (2015). "Rqc2p and 60S ribosomal subunits mediate mRNA-independent elongation of nascent chains". Science. 347 (6217): 75–8. Bibcode:2015Sci...347...75S. doi:10.1126/science.1259724. PMC 4451101. PMID 25554787. ^ Keeley, Jim; Gutnikoff, Robert (2015-01-02). "Ribosome Studies Turn Up New Mechanism of Protein Synthesis" (Press release). Howard Hughes Medical Institute. Archived from the original on 2015-01-12. Retrieved 2015-01-16. ^ University of Würzburg. (2016, October 6). Ribosomal quality control. ScienceDaily. "Ribosomal quality control". Archived from the original on 2017-11-07. Retrieved 2017-11-13. ^ "Ribosomal quality control". Archived from the original on 2017-08-27. Retrieved 2017-08-27. ^ a b Noller, H. F. (2012). "Evolution of protein synthesis from an RNA world". Cold Spring Harbor Perspectives in Biology. 4 (4): 1–U20. doi:10.1101/cshperspect.a003681. PMC 3312679. PMID 20610545. ^ Dabbs, E.R. (1986). Mutant studies on the prokaryotic ribosome. Springer-Verlag, N.Y.
^ Noller, H. F.; Hoffarth, V.; Zimniak, L. (June 5, 1992). "Unusual resistance of peptidyl transferase to protein extraction procedures". Science. 256 (5062): 1416–1419. Bibcode:1992Sci...256.1416N. doi:10.1126/science.1604315. PMID 1604315. ^ Nomura, M.; Mizushima, S.; Ozaki, M.; Trau, P.; Lowry, C. V. (1969). "Structure and function of ribosomes and their molecular components". Cold Spring Harbor Symposium of Quantitative Biology. 34: 49–61. doi:10.1101/sqb.1969.034.01.009. ^ a b Root-Bernstein, M.; Root-Bernstein, R. (2015). "The ribosome as a missing link in the evolution of life". Journal of Theoretical Biology. 367: 130–158. doi:10.1016/j.jtbi.2014.11.025. PMID 25500179. ^ Yarus M (2002). "Primordial genetics: phenotype of the ribocyte". Annu. Rev. Genet. 36: 125–51. doi:10.1146/annurev.genet.36.031902.105056. PMID 12429689. ^ Forterre, Patrick; Krupovic, Mart (2012). "The Origin of Virions and Virocells: The Escape Hypothesis Revisited". Viruses: Essential Agents of Life. pp. 43–60. doi:10.1007/978-94-007-4899-6_3. ISBN 978-94-007-4898-9. ^ Caetano-Anolles, G.; Seufferheld, M. J. (2013). "The coevolutionary roots of biochemistry and cellular organization challenge the RNA world paradigm". Journal of Molecular Microbiology and Biotechnology. 23 (1–2): 152–177. doi:10.1159/000346551. PMID 23615203. ^ Saladino, R.; Botta, G.; Pino, S.; Costanzo, G.; Mauro, E. Di (2012). "Genetics first or metabolism first? The formamide clue". Chemical Society Reviews. 41 (16): 5526–5565. doi:10.1039/c2cs35066a. PMID 22684046. ^ Bauer, Johann W.; Brandl, Clemens; Haubenreisser, Olaf; Wimmer, Bjoern; Weber, Manuela; Karl, Thomas; Klausegger, Alfred; Breitenbach, Michael; Hintner, Helmut (2013-07-08). "Specialized Yeast Ribosomes: A Customized Tool for Selective mRNA Translation". PLoS ONE. 8 (7): e67609. Bibcode:2013PLoSO...867609B. doi:10.1371/journal.pone.0067609. ISSN 1932-6203. PMC 3704640. PMID 23861776. ^ Mauro, Vincent P.; Edelman, Gerald M. (2002-09-17). "The ribosome filter hypothesis". Proceedings of the National Academy of Sciences of the United States of America. 99 (19): 12031–12036. Bibcode:2002PNAS...9912031M. doi:10.1073/pnas.192442499. ISSN 0027-8424. PMC 129393. PMID 12221294. ^ Xue, Shifeng; Barna, Maria (May 23, 2012). "Specialized ribosomes: a new frontier in gene regulation and organismal biology". Nature Reviews Molecular Cell Biology. 13 (6): 355–369. doi:10.1038/nrm3359. ISSN 1471-0080. PMC 4039366. PMID 22617470. ^ Mathis, Andrew (8 Dec 2016). "Mechanisms of in vivo ribosome maintenance change in response to nutrient signals". Molecular & Cellular Proteomics. mcp.M116.063255. (2): 243–254. doi:10.1074/mcp.M116.063255. PMC 5294211. PMID 27932527. ^ a b Guo, Huili (2018-08-20). "Specialized ribosomes and the control of translation". Biochemical Society Transactions. 46 (4): 855–869. doi:10.1042/BST20160426. ISSN 1470-8752. PMID 29986937. ^ Ballesta, J. P.; Guarinos, E.; Rodriguez-Gabriel, M. A.; Bermejo, B.; Jimenez-Diaz, A.; Remacha, M. (1995-09-01). "Ribosomal acidic phosphoproteins P1 and P2 are not required for cell viability but regulate the pattern of protein expression in Saccharomyces cerevisiae". Molecular and Cellular Biology. 15 (9): 4754–4762. doi:10.1128/MCB.15.9.4754. ISSN 1098-5549. PMC 230719. PMID 7651393. ^ Artero-Castro, Ana; Perez-Alea, Mileidys; Feliciano, Andrea; Leal, Jose A; Genestar, Mónica; Castellvi, Josep; Peg, Vicente; Ramón y Cajal, Santiago; LLeonart, Matilde E (2015-07-15). "Disruption of the ribosomal P complex leads to stress-induced autophagy". Autophagy. 11 (9): 1499–1519. doi:10.1080/15548627.2015.1063764. ISSN 1554-8627. PMC 4590587. PMID 26176264. ^ Marygold, S. J. (2005-02-01). "Genetic Analysis of RpL38 and RpL5, Two Minute Genes Located in the Centric Heterochromatin of Chromosome 2 of Drosophila melanogaster". Genetics. 169 (2): 683–695. doi:10.1534/genetics.104.034124. ISSN 0016-6731. PMC 1449105. PMID 15520262. ^ Kondrashov, Nadya; Pusic, Aya; Stumpf, Craig R.; Shimizu, Kunihiko; Hsieh, Andrew C.; Xue, Shifeng; Ishijima, Junko; Shiroishi, Toshihiko; Barna, Maria (April 2011). "Ribosome-Mediated Specificity in Hox mRNA Translation and Vertebrate Tissue Patterning". Cell. 145 (3): 383–397. doi:10.1016/j.cell.2011.03.028. ISSN 0092-8674. PMC 4445650. PMID 21529712. ^ Lee, S.-W.; Berger, S. J.; Martinovic, S.; Pasa-Tolic, L.; Anderson, G. A.; Shen, Y.; Zhao, R.; Smith, R. D. (2002-04-30). "Direct mass spectrometric analysis of intact proteins of the yeast large ribosomal subunit using capillary LC/FTICR". Proceedings of the National Academy of Sciences. 99 (9): 5942–5947. Bibcode:2002PNAS...99.5942L. doi:10.1073/pnas.082119899. ISSN 0027-8424. PMC 122881. PMID 11983894. ^ Carroll, Adam J.; Heazlewood, Joshua L.; Ito, Jun; Millar, A. Harvey (2007-10-13). "Analysis of theArabidopsisCytosolic Ribosome Proteome Provides Detailed Insights into Its Components and Their Post-translational Modification". Molecular & Cellular Proteomics. 7 (2): 347–369. doi:10.1074/mcp.m700052-mcp200. ISSN 1535-9476. PMID 17934214. ^ Yu, Yonghao; Ji, Hong; Doudna, Jennifer A.; Leary, Julie A. (2009-01-01). "Mass spectrometric analysis of the human 40S ribosomal subunit: Native and HCV IRES-bound complexes". Protein Science. 14 (6): 1438–1446. doi:10.1110/ps.041293005. ISSN 0961-8368. PMC 2253395. PMID 15883184. ^ Zeidan, Quira; Wang, Zihao; De Maio, Antonio; Hart, Gerald W. (2010-06-15). "O-GlcNAc Cycling Enzymes Associate with the Translational Machinery and Modify Core Ribosomal Proteins". Molecular Biology of the Cell. 21 (12): 1922–1936. doi:10.1091/mbc.e09-11-0941. ISSN 1059-1524. PMC 2883937. PMID 20410138. ^ Spence, Jean; Gali, Rayappa Reddy; Dittmar, Gunnar; Sherman, Fred; Karin, Michael; Finley, Daniel (July 2000). "Cell Cycle–Regulated Modification of the Ribosome by a Variant Multiubiquitin Chain". Cell. 102 (1): 67–76. doi:10.1016/s0092-8674(00)00011-8. ISSN 0092-8674. PMID 10929714. ^ Sauert, Martina; Temmel, Hannes; Moll, Isabella (July 2015). "Heterogeneity of the translational machinery: Variations on a common theme". Biochimie. 114: 39–47. doi:10.1016/j.biochi.2014.12.011. ISSN 0300-9084. PMC 4894553. PMID 25542647. ^ Thompson, Mary K; Rojas-Duran, Maria F; Gangaramani, Paritosh; Gilbert, Wendy V (2016-04-27). "The ribosomal protein Asc1/RACK1 is required for efficient translation of short mRNAs". eLife. 5. doi:10.7554/elife.11154. ISSN 2050-084X. PMC 4848094. PMID 27117520. ^ Landry, D. M.; Hertz, M. I.; Thompson, S. R. (2009-12-01). "RPS25 is essential for translation initiation by the Dicistroviridae and hepatitis C viral IRESs". Genes & Development. 23 (23): 2753–2764. doi:10.1101/gad.1832209. ISSN 0890-9369. PMC 2788332. PMID 19952110. ^ Deniz, N.; Lenarcic, E. M.; Landry, D. M.; Thompson, S. R. (2009-03-24). "Translation initiation factors are not required for Dicistroviridae IRES function in vivo". RNA. 15 (5): 932–946. doi:10.1261/rna.1315109. ISSN 1355-8382. PMC 2673076. PMID 19299549. ^ Hertz, M. I.; Landry, D. M.; Willis, A. E.; Luo, G.; Thompson, S. R. (2012-12-28). "Ribosomal Protein S25 Dependency Reveals a Common Mechanism for Diverse Internal Ribosome Entry Sites and Ribosome Shunting". Molecular and Cellular Biology. 33 (5): 1016–1026. doi:10.1128/mcb.00879-12. ISSN 0270-7306. PMC 3623076. PMID 23275440. ^ Decatur, Wayne A; Fournier, Maurille J (July 2002). "rRNA modifications and ribosome function". Trends in Biochemical Sciences. 27 (7): 344–351. doi:10.1016/s0968-0004(02)02109-6. ISSN 0968-0004. ^ Natchiar, S. Kundhavai; Myasnikov, Alexander G.; Kratzat, Hanna; Hazemann, Isabelle; Klaholz, Bruno P. (2017-11-15). "Visualization of chemical modifications in the human 80S ribosome structure". Nature. 551 (7681): 472–477. Bibcode:2017Natur.551..472N. doi:10.1038/nature24482. ISSN 0028-0836. PMID 29143818.